If you are like most people, your resolve to keep healthy wanes as the week goes by. Monday you may be raring to take a run and eat right, but by Wednesday you likely already have had some healthy living hiccups. This week: a recipe that includes mushrooms, a superfood with tremendous cancer-fighting potential. Heat olive oil over medium heat in a large saute pan. Cook onion, carrots, celery, garlic, and herbs until vegetables are tender. Stir in lentils and season with salt and pepper to taste. Transfer lentil vegetable mixture to a large bowl. Wipe pan clean and add 1-tablespoon olive oil. Cook mushrooms for about 2 minutes per side until starting to soften. Place mushrooms, cap down, in a baking dish. 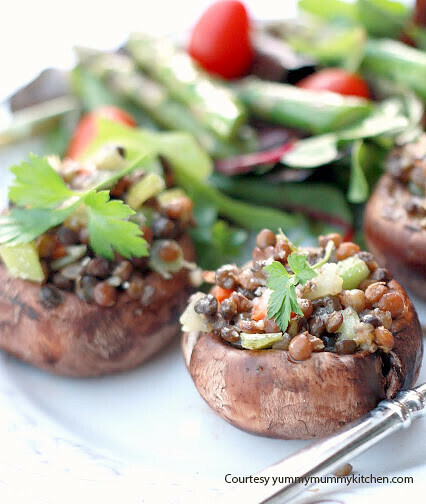 Fill mushrooms with lentil mixture. Drizzle with a little olive oil if dry. Sprinkle with Parmesan. Place under broiler until warm and cheese starts to melt. Garnish with fresh herbs such as parsley or basil. You can find this recipe and many others at YummyMummyKitchen.com. You can also find them on Flicker, Facebook, Twitter, and Pinterest. For more info on Superfoods for Super Health and City of Hope research visit our Superfoods site.